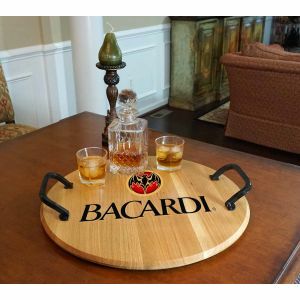 Branded Barrel Head Serving Tray. Made from a new wine or whiskey barrel head and include wrought iron handles. Each tray is individually boxed. Design proof included with no charge on orders of 5 or more, a $10 proofing fee on orders less than 5 units will be charged after the order is placed.